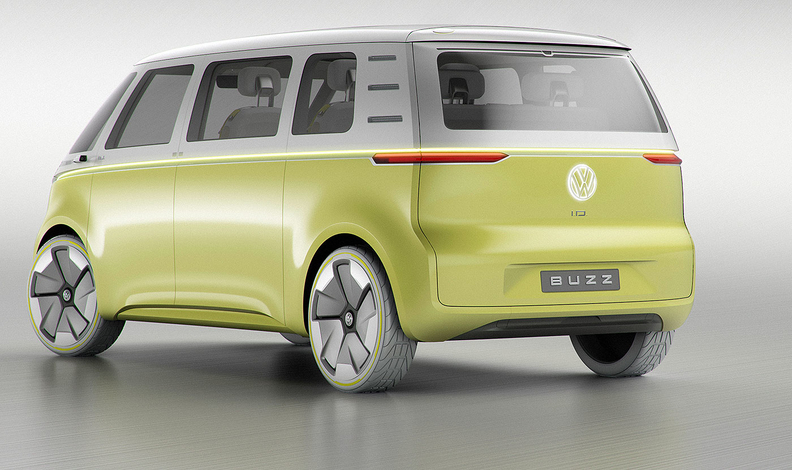 The Buzz concept is built from VW's MEB architecture. 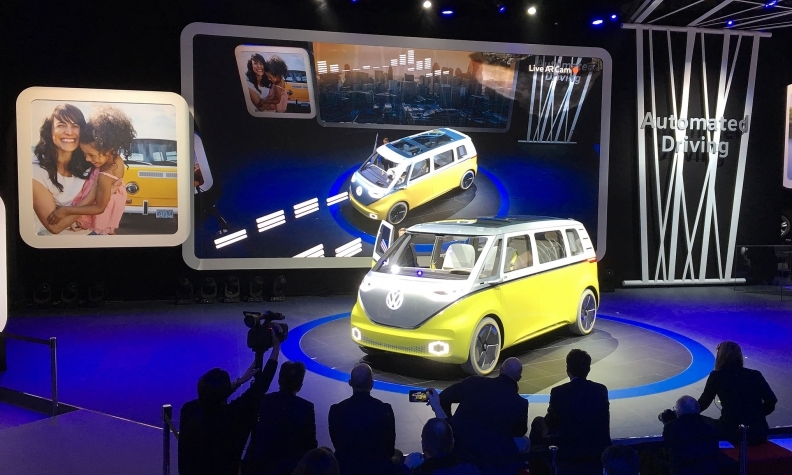 DETROIT -- Volkswagen’s latest conceptual take on its historic Microbus uses a powerful battery pack and two electric motors to transform the once anemically powered hippie-mobile into an all-wheel-drive, high-capacity autonomous minivan. The I.D. Buzz concept -- unveiled by VW Sunday at the Detroit auto show -- has a floor-mounted 111-kWh battery pack and up to 369 hp with an effective range of up to 270 miles under U.S. standards and 600 km under European standards, the automaker said. The Buzz is built from VW’s Modular Electric Drive Kit, or MEB, which also underpins the compact I.D. hatchback concept the automaker showed at the 2016 Paris auto show. Like the earlier concept, the I.D. Buzz concept features the automaker’s I.D. Pilot autonomous driving system with a squared steering wheel that fully retracts into the instrument panel when the autonomous driving system is engaged. VW said it envisions the concept in two different optional powertrain configurations. In some regions, a rear-drive single motor would produce 268 hp and be paired with a smaller 83 kWh battery pack. Elsewhere, the Buzz would employ an all-wheel-drive, two-motor configuration that distributes power from the larger battery pack between the two axles electrically. VW says that in its all-wheel-drive configuration, the battery-powered I.D. Buzz can accelerate from 0 to 60 mph in 5.0 seconds. The automaker said its battery pack can be recharged to 80 percent of capacity in as little as 30 minutes using high-energy recharging systems. Inside the cabin, especially in autonomous mode, the I.D. Buzz concept looks more like a lounge than a traditional people-hauler, especially with its railed customizable seating system. In full autonomous mode, front seats can swivel rearward, with the seatbacks of the center-row seats able to be folded to form tables, and the third-row seating capable of being made into a bed, the automaker said. The I.D. Buzz also eschews a traditional automotive cockpit in favor of a touch-sensitive steering mechanism, an augmented reality heads-up-display, and a large, detachable center-mounted tablet information screen. The configuration allowed designers to increase the space between the first-row seating and the instrument panel by almost 6 inches. In terms of exterior design, the I.D. Buzz leaves little doubt about its Microbus ancestry, with styling cues taken directly from its historic lineage and augmented with modern touches such as fully integrated LED lighting, animated in a way to react to its driver’s presence. The wheels are mounted at the corners of the concept, giving it a wide stance on its long 129.9-inch wheelbase. The automaker could launch the electric Microbus as early as 2022, if management signs off on the project, VW brand design boss Klaus Bischoff said. "We're hoping that showing this [at the show] will increase the chances of realization," he told Automotive News Europe on Sunday, the eve of the auto show. Still reeling from the legal aftershocks from its decade-long diesel emissions fraud, VW aims to sell 1 million battery-electric vehicles worldwide by 2025. In addition, VW brand CEO Herbert Diess told reporters last November that the automaker was reversing its strategy and would no longer offer diesels in the U.S. in the future. “We are making electric mobility the new trademark of Volkswagen,” Diess said in a statement. Bischoff said the MEB's flexibility, with its chocolate bar-style flat battery housed in the floor, finally allowed designers the freedom to recreate the proportions of the original Microbus with its flat nose.